This complete guide to backpacking in Penang has everything you need to know to hit the ground running. From the best backpacker hostels, to suggestions on where to party, eat and other basic backpacker needs, this is Penang Backpacker 101. Like it or not, in recent years backpackers flooded Penang as they travel between Thailand and Kuala Lumpur/ Singapore . Penang, in fact, offers a free and 90-days long tourist visa and has steadily become a hotspot for backpackers in the region. Are you a backpacker in Penang and you don’t know where to start? This guide to backpacking Penang has everything you need to know in regards to the best backpacker accommodation in Penang, the most happening backpacker hangouts in George Town, where to find local food (check out our beginners guide to Penang’s must-try dishes) and Western comfort foods in George Town, and tips and tricks on what to do, see, and where to go party and sunbathing as a backpacker in George Town and Penang. First of all, where do backpackers go in Penang? First of all, Penang is an island, but it’s pretty developed – forget a beach backpacking experience like you can have, for example, in Gili Trawangan, Indonesia. Penang’s backpacker central is the cluster of side lanes around Chulia Street, especially Love Lane and Muntri Street. 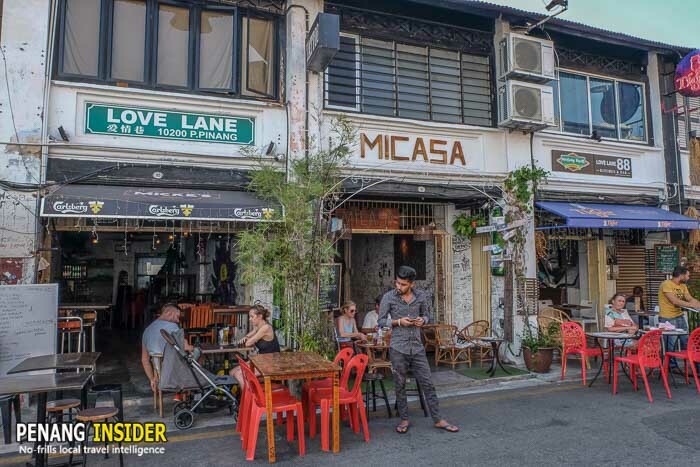 From lively backpacker bars to Western-style cafes and bistros, the middle section of Chulia Street may not be Penang’s most authentic, but it’s a hit with international backpackers. They come, check into a backpacker hostel, and don’t stray too far from the convenience of the bars and clubs around Chulia Street. Penang nightlife here is indeed quite happening. Just look for the junction of Chulia Street and Love Lane, where you’ll find a 7/11 convenience store on the corner, right opposite the Chulia Court Mansion and the Reggae Bar. 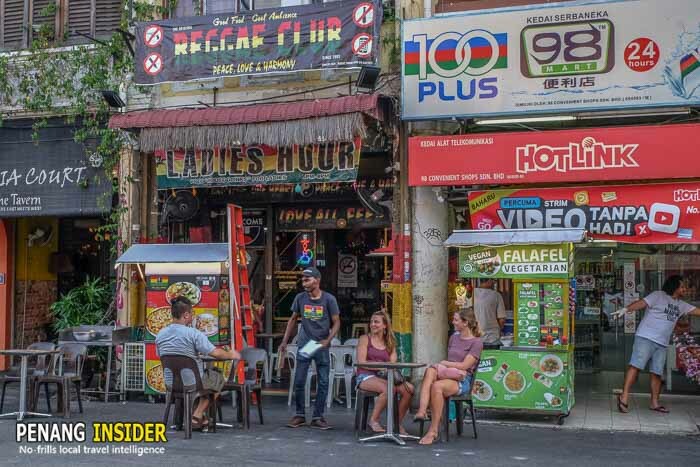 This is where most backpacker action happens in George Town and Penang. How much does backpacking in Penang cost per day? It really depends on your habits and whether you are a drinker or not, but costs for backpacking in Penang can be limited to about USD 10 – 20 per day. You may shave off some costs if you decide to cater to your food by yourself. Check out a list of the best places for buying groceries in Penang. The crossroads between Chulia Street and Love Lane (where the 7/11 is) is also where most buses coming from the Weld Quay Jetty stop on their way to KOMTAR and the rest of the island. Rapid Penang buses cost only RM 1.40 for a ride that won’t exceed 5km and go up after that to a maximum of RM 4.50 to Teluk Bahang, where Penang National Park is, or Penang International Airport, which are both at the end of the line. In George Town, you may as well just walk around, as it’s easy to navigate and compact. Otherwise, you may want to rent a scooter (from RM 30/day) along the several outlets along Chulia Street. Filling up the tank will cost between RM 7 and 10 (2 to 2.5 USD). As a last convenient resort, Penang is serviced by Grab Car and prices are pretty convenient outside rush hour (8 to 9 am and 6 to 8 pm). 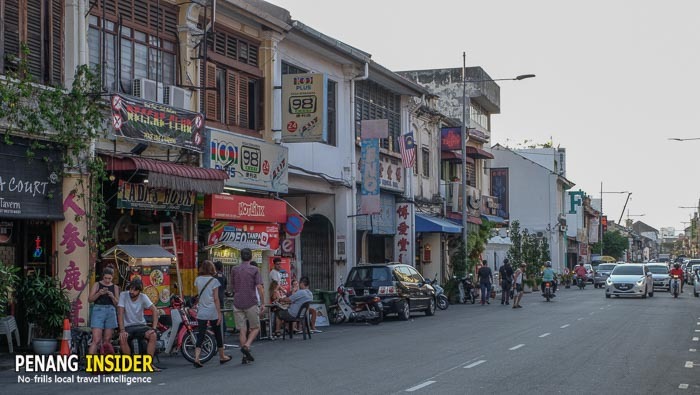 Penang’s tourist and backpacker central of Chulia Street, Love Lane and Muntri Street and outlining roads are packed to the gills with accommodation options to suit every budget. 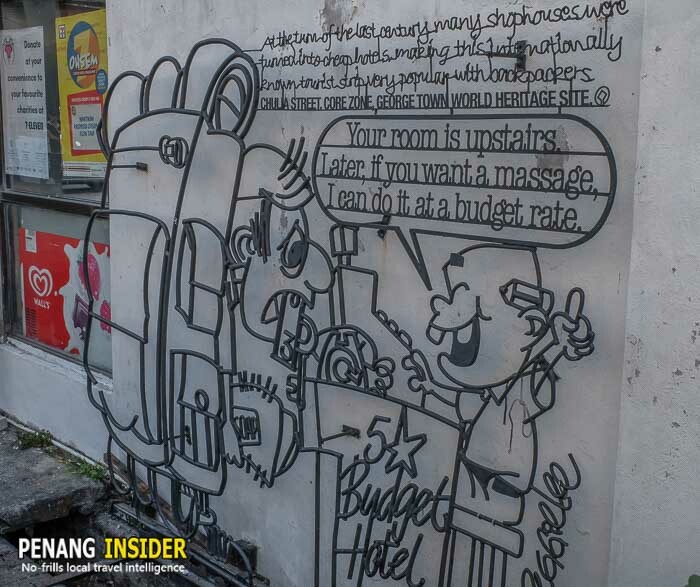 In terms of cheap backpacker hostels in Penang, the surge of budget travelers arrivals these days means there are way too many to choose from. 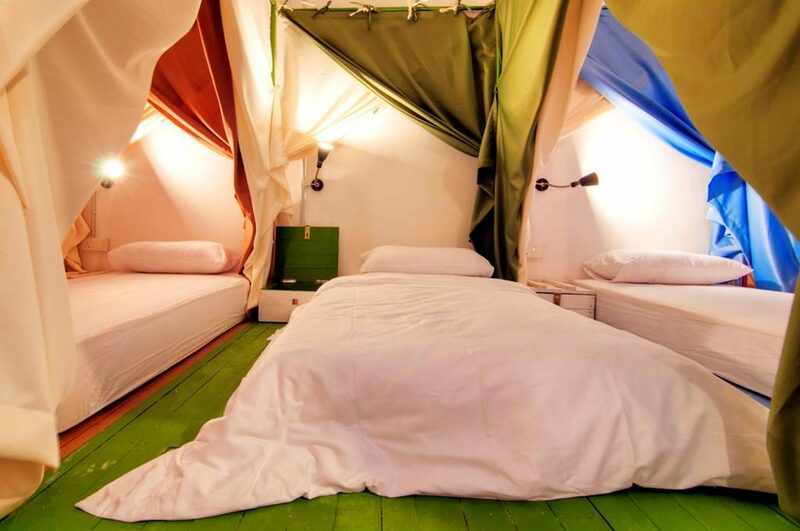 We have compiled a list of 17 of the best cheap backpacker accommodation options in and around George Town. Consider that, on average, dorms go for about RM20 to RM35 (USD 5 to 8.5), and private en-suite double rooms for RM100 (USD 25) per night. 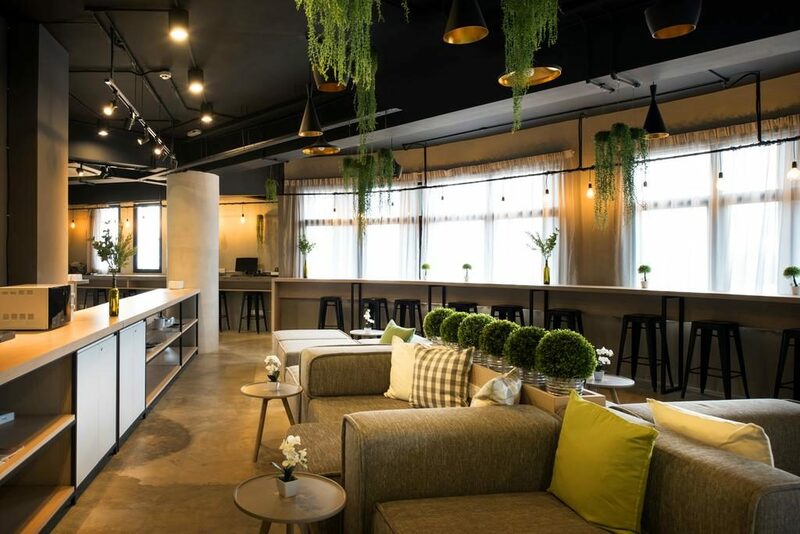 The standard is pretty high, however, with very well furnished and clean backpacker hostels, most of which offer top of the range facilities, such as lockers, individual pods, privacy curtains, power stations, etcetera. Blogging transparency: If you like this website and found the information contained in this post useful, please note that, if you book a dorm/room through our links, we will get a small commission at no extra cost to you. Consider it a small way to say thanks, and keep Penang Insider going. 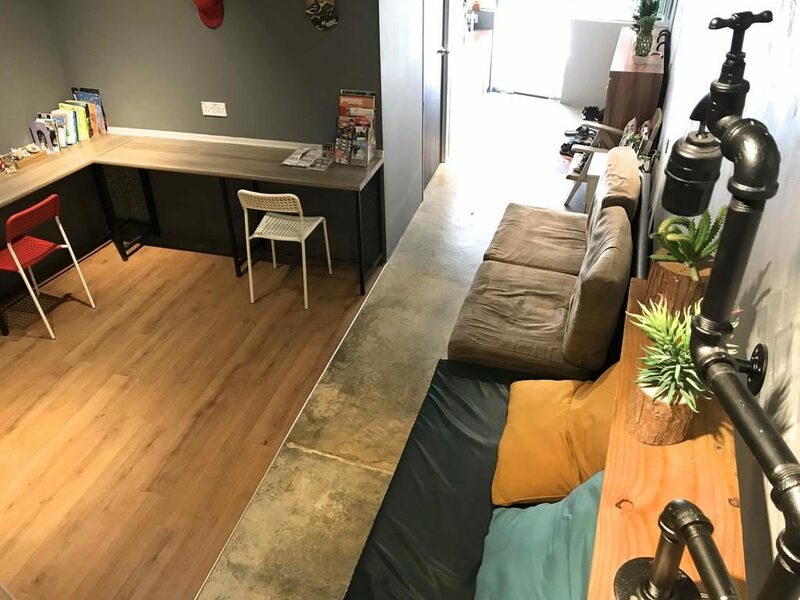 Set in a corner shophouse in Lorong Sek Chuan, straight in the heart of Penang’s backpacking action, and yet tucked up a quiet road, House of Journey is our favorite backpacker hostel in Penang. The dorms are airy, sparkling clean and have industrial-chic shared bathrooms with all the perks modern backpackers have come to expect. Hundreds of musings scribbled on the wall give this place a cool, seasoned traveler vibe few other backpacker hostels have in Penang. You won’t regret your stay here. 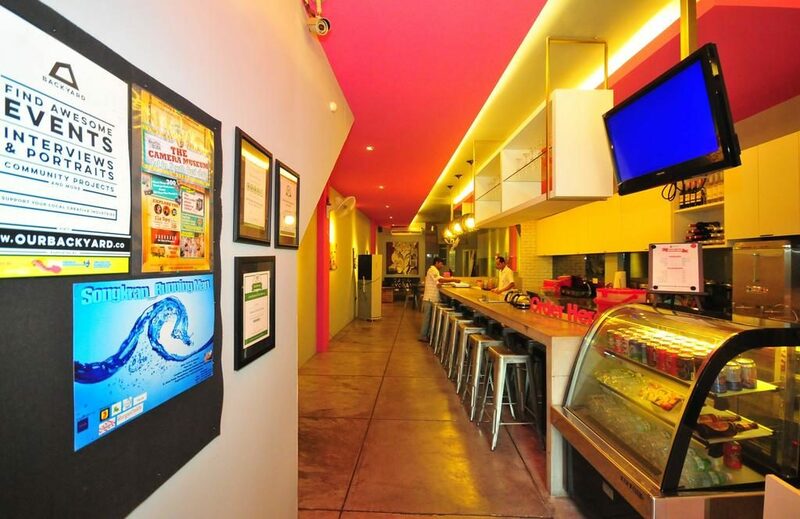 A beautiful hostel with flashy individual pods, set right on top of popular bistro Mugshot, literally in the center of Chulia Street’s action. Swanky, cool, and in walking distance to everything. This boutique hostel brings a Japanese concept straight in the midst of popular Muntri Street. 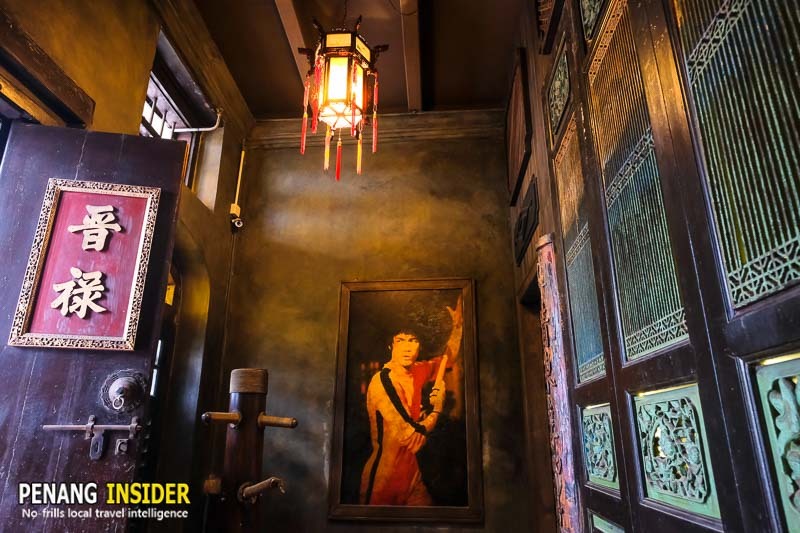 Housed within a Penang street art-covered shophouse, the immaculate dorms and private en-suite rooms here are some of the most flashy for backpackers. The colorful, industrial chic common room packs very good vibes, too. More of a full-scale hotel than a hostel, Tido is tucked at the end of Magazine road, in 5 minutes walk from bustling Chulia Street. It has dorms with plush beds and wooden partitions, reading lights, lockers, and a very charming, boutique atmosphere. The lounge is just great, with minimal chic furnishings and comfy couches to chill. 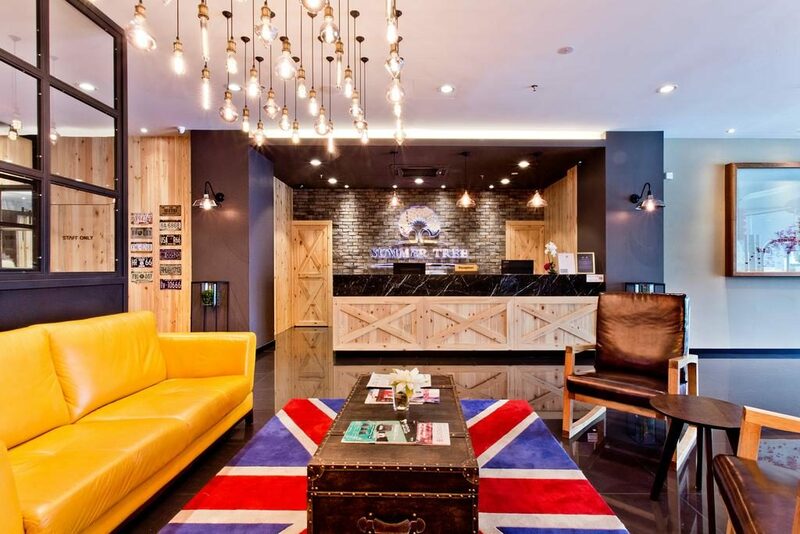 The place for the young and debonair under 30, Angmoh is a party hostel developed over five stories. The dorms are adequate, and yet not the best if you want to have a peaceful night sleep — again, this is party central. A good spot to socialize and spend time with other backpackers, just off Chulia Street. 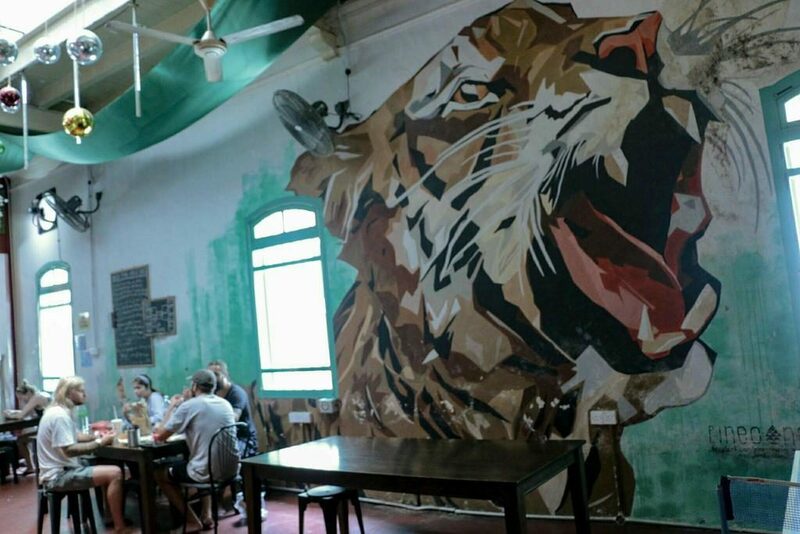 Here’s yet another of Penang’s party hostels: if you are exclusively looking to mingle with other white travelers, chugging beers, dancing to a techno cannonade, and progressively lose memory of your night, Tipsy Tiger is the right place to stay. 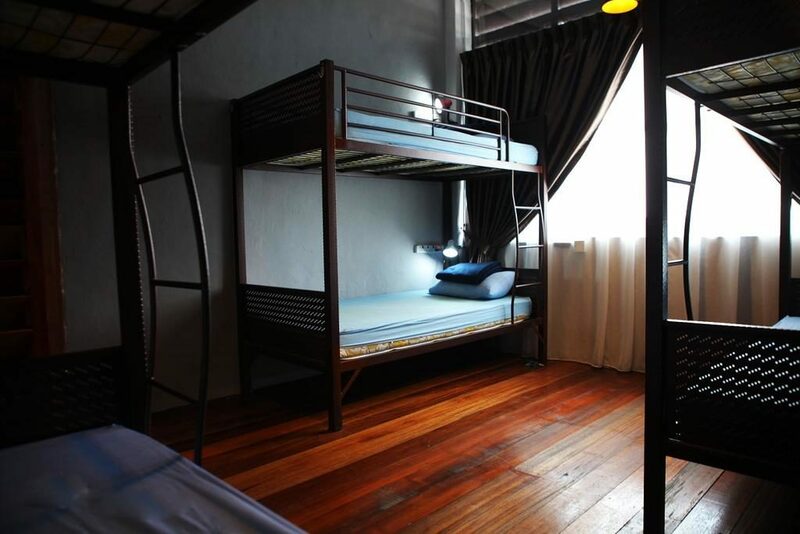 This is one of our favorite, long-standing Penang backpacker hostels. Set in Hutton Lane, in 5 minutes walking distance to Chulia street, it’s housed in a beautiful colonial mansion with its own garden. Rooms are spartan yet clean and cozy, and the common areas are very retro and attractive. A perfect, cheap and atmospheric dig to explore George Town at leisure. Another nice flashpacker option, with larger than usual rooms, most with private bathrooms, and some set like mini-apartments. There’s a good free breakfast changing daily, bicycles for rent, and the chance to hire knowledgeable local guides. A good option for backpackers set in front of Penang’s Clan Jetties, with scenic views over the sea. 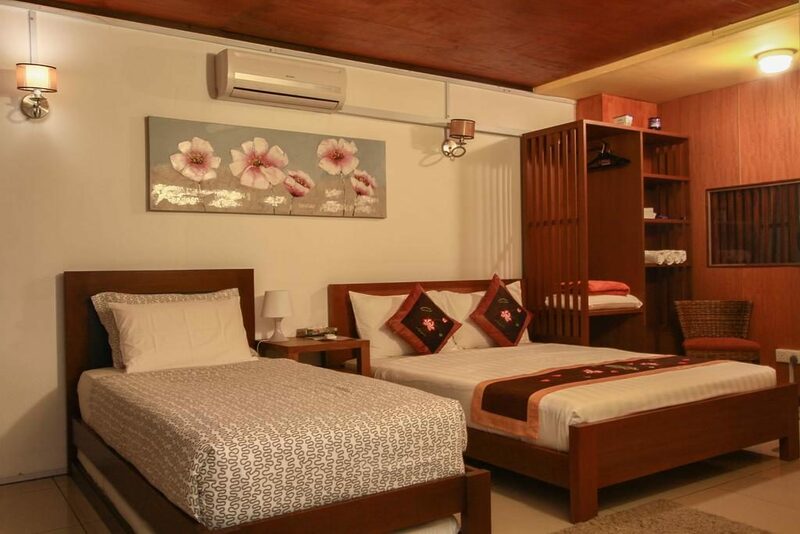 It has dorms with privacy curtains, private rooms, and nice common areas to chill and meet other travelers. Part of a franchise present in most major backpacking cities of Malaysia, this upper-end flashpacker pad has all the bells and whistles required by modern day travelers. Plush mattress, individual pods, reading lights, and immaculate shared bathrooms are all part of the package. Another place for the party-loving backpackers, its main feature is a swimming pool, mural art by Tom Powell, and an open bar that fills up with drifters and drinkers on every good night. Tucked up Hutton Lane, it’s a bit more relaxed than other Penang party hostels. 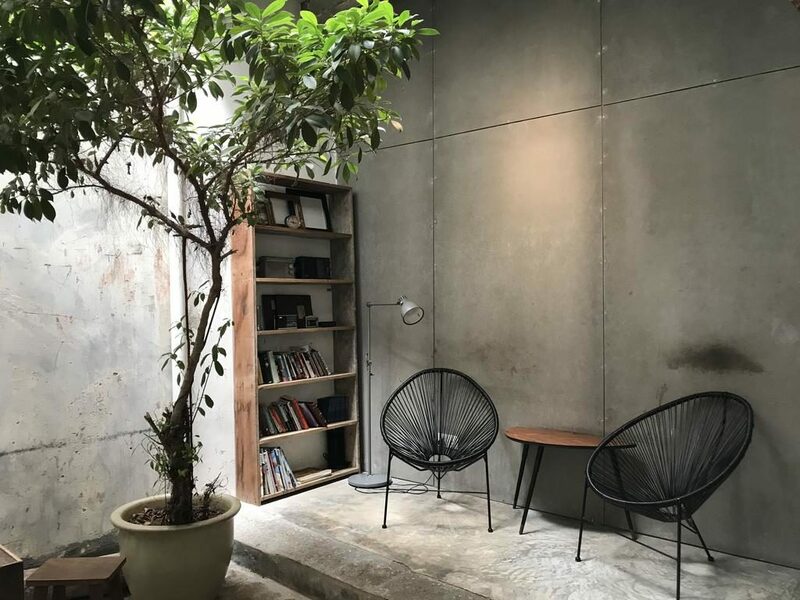 One perfect industrial-chic designed guesthouse for flashpacker, it’s right along Chulia Street and a good choice for those who don’t want to sacrifice comfort when traveling. 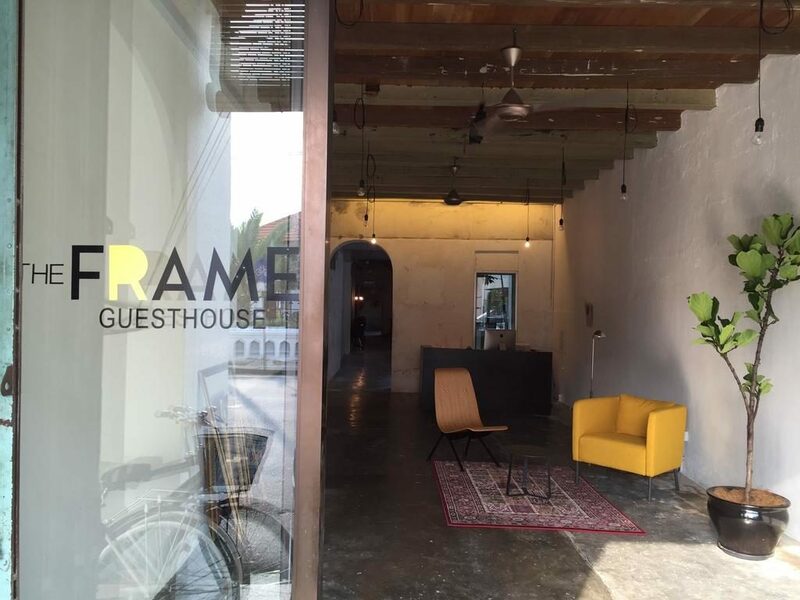 A sister property of The Frame Guesthouse, the 80’s Guesthouse caters to more of that flashpacker crowd. Tucked at the quieter end of noisy Love Lane, it’s stylishly furnished with memorabilia from the 1980s, paired with minimal chic furnishings and naked light bulbs. Very central and attractive. 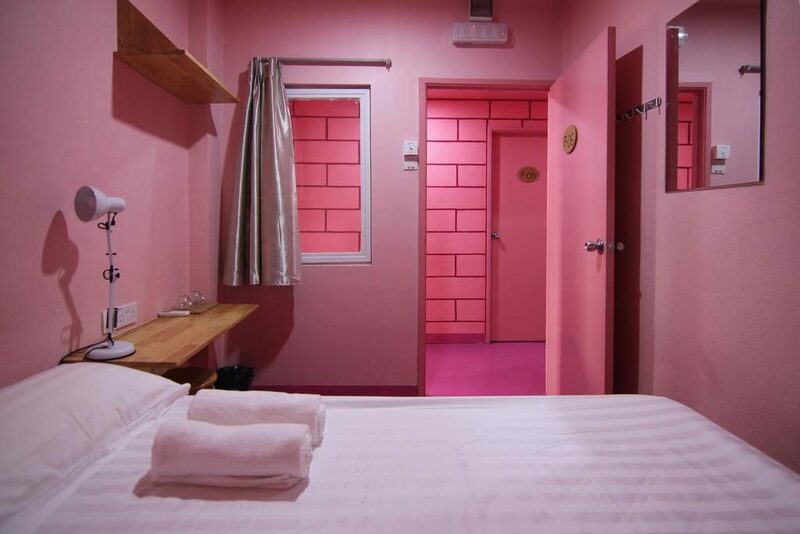 Set in a quiet alley in Little India, this beautiful hostel is just for girls. The dorms are charming, protected by colorful individual curtains, and the shabby-chic design is studied to appeal to female tastes. The complimentary manicure sets and immaculate bathrooms are nice touches. 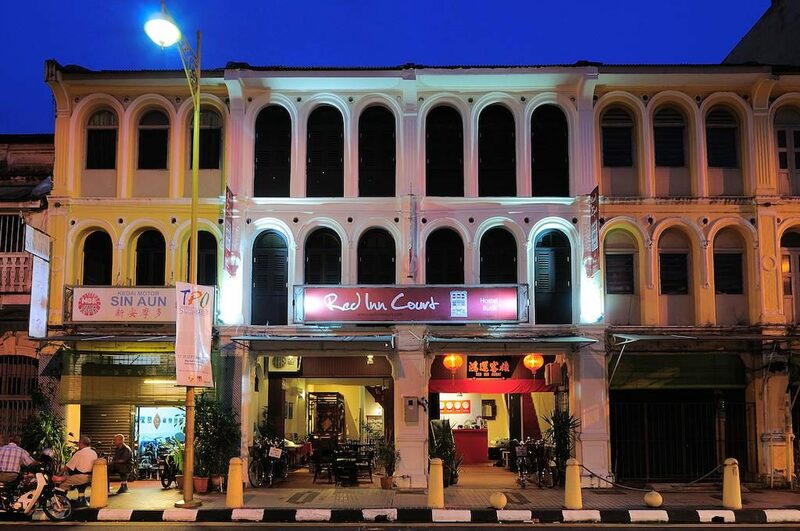 Super central and set into a beautiful shophouse, Red Inn Court has been around for many years, tirelessly serving backpackers have a cozy stay in Penang. 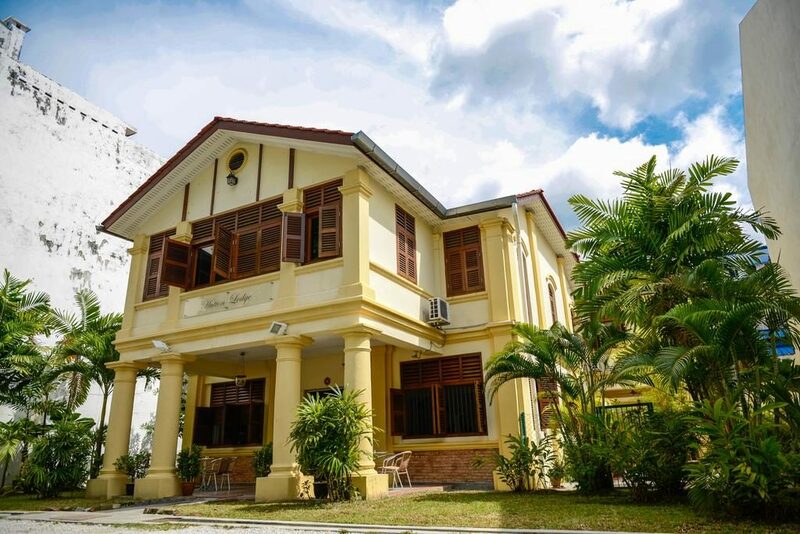 They have bicycle rental, a nice lounge on the first floor, and they are located on a quiet corner of Jalan Masjid Kapitan Keling, in meters from temples and Chulia Street’s action. A nice, new hostel offering beautiful private rooms, squeaky clean dorms, and a social atmosphere without the loud partying. There’s a common kitchen area that feels homely, and the owner makes his best to make every guest feel special. Highly recommended. More of a budget hotel than a hostel, this place has a swanky hall and better than average rooms for those backpackers needing a break from the usual shoestring. Get pampered here the right way, and enjoy Penang refreshed. With three days in Penang, you can explore a little bit more. Check our Penang in 3 days ultimate itinerary. Besides your own hostel’s common room, the majority of backpackers hang out in Chulia Street and Love Lane. The area is pretty small and one just has to walk around and make eye contact with other backpackers to get a conversation started. 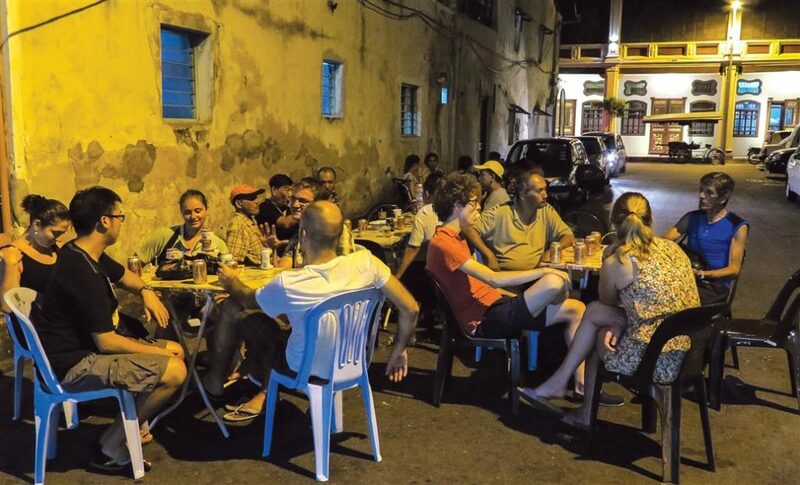 Another interesting option that will allow for some local interaction is participating in the weekly Couchsurfing Penang meetings, held in a different cafe’ every Friday night from 8.30 pm to 10.30 pm. Sign up to Couchsurfing and check the Penang event page here. Being in the center of town, Penang’s backpacker area is in walking distance to a huge range of shops. If you need to have something replaced or fixed, you’ll be most certainly able to do so somewhere in George Town. Need to replace your backpacking clothing and want to keep it on a shoestring? Have no fear, for on 41 Chulia Street you can find the Kawan Shop, run by Youth with a Mission Penang. It sells second-hand clothes and other stuff, whose profits are used to help homeless people have a warm meal and have a place to bathe and wash their clothes. A little far out of town on the southern part of the island, right in front of the Bukit Jambul shopping mall area (catch bus 101 from KOMTAR) is Doubt? (see map), specializing in second-hand Japanese clothes and pre-loved fashion. Their choice is wide and pretty trendy as well, so it’s definitely worth the time you need to get there. This mall, one of the best shopping malls in Penang, is also one of the oldest and cheapest. 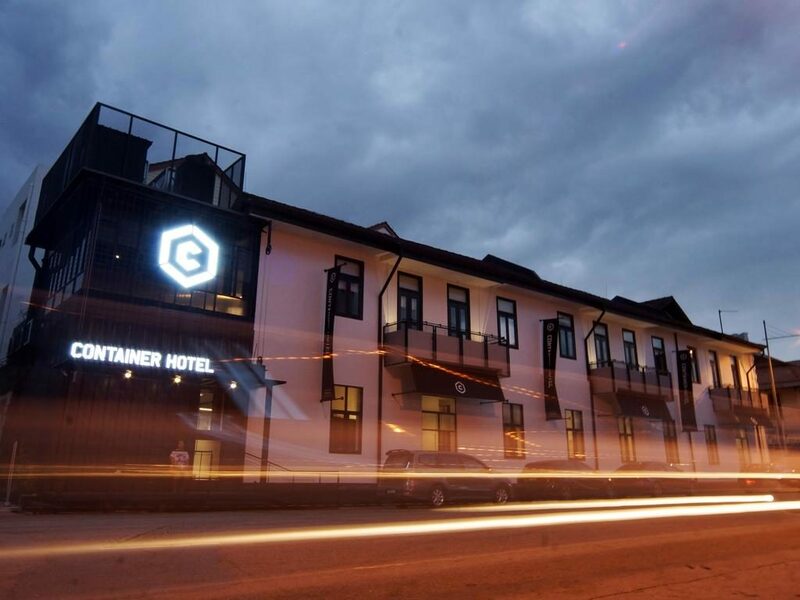 It’s very convenient for backpackers as it’s right next to the KOMTAR building, straight in the center of George Town and in 5 minutes walk from Chulia Street. Prangin Mall has a lot of different things for sale, from cheap clothes (on the 1st and 2nd floor) to electronics and computers (on the 4th floor), shoes and a lot of mobile phones (on the ground floor). It’s also convenient for backpackers looking to purchase a SIM card as it has shops from the main telecommunication companies in Malaysia, including Maxis, Digi, and UMobile. There are also several travel agents here selling bus tickets to many destinations in Malaysia. Penang backpackers usually only have a few days to explore the island (see our guide to spending the perfect 3 days in Penang)and therefore don’t really move very far from central George Town. Luckily for them, that’s where most of Penang party spots are located. 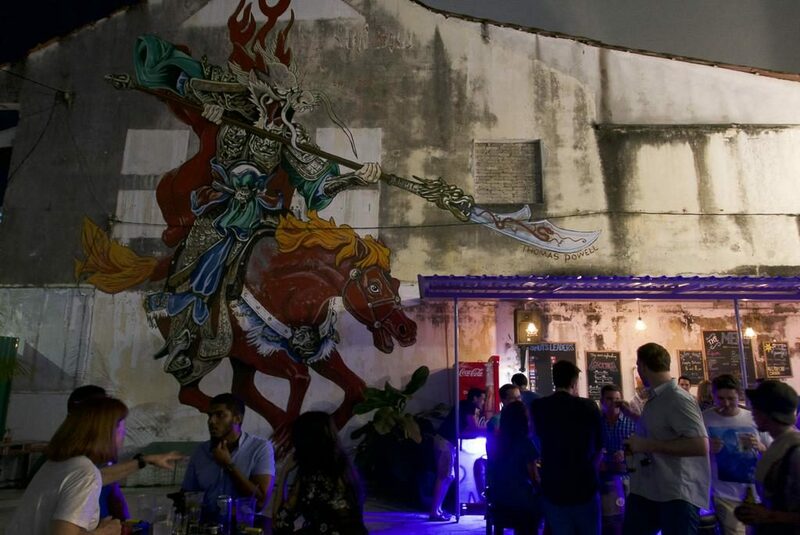 George Town has a smorgasbord of bars and nightlife to suit any taste. From small drinking holes to proper Irish pubs and a Reggae Bar, all a backpacker has to do is walk down Chulia Street and stop where she fancies. The upper part of Love Lane, connected to Chulia Street, is now packed with backpackers bars from wall to wall. Mike’s Place is a popular hangout that spills tables on the street and collects the written musings of a thousand travelers on its walls. They have live musicians strumming guitars and singing on most nights and are possibly the friendliest backpacker joint in town. In front of it, Wheeler’s Cafe is slightly more upmarket, with a menu of Western comfort foods, coffees, and good fruit juices. Right up the road is a series of bars, including Eclipse Bar & Cafe, Friend Forever Bistro and Bohemian Home Bistro, most of which are kinda cookie-cutter and offer the usual happy hour specials and average food. But if you are a real penny-pinching backpacker, just consider that prices in this area soar because of the travelers, who don’t mind paying more than RM10 for a drink — very overpriced for normal Penang standards. Once a backstreet dive populated by crazy locals and ever-drunken Indian patrons and some local gangster, Antarabangsa has sadly turned to be a hipster dive. Backpackers love it because of its cheap beers, the cheapest in town, that go for about RM4 per can, and the series of red plastic stools and sticky tables that spill on the curb. We have had a few glorious drunken nights here before it turned to cater to the under 35 foreigner party crowd and we don’t prefer it anymore. But it must be said, it does get many young locals, too, and it can be a great place for backpackers to start dive into real Penang life, well beyond the limits of the hostel. We already listed this hostel among the accommodation section above, but it’s worth mentioning it again as the prime spot for backpacking party action. Yes, of the ugliest sort that’s so popular in the tourist towns of Southeast Asia: think white gap year drunken know-it-all schmucks partying with their own kind. Beers are on the expensive side, and if you are not into a drunken game of pool or young, barefoot, scantily clad and cellulitic Anglo-European drunk girls, you better stay the hell away from this place. The music is a techno cannonade that will only appeal to that sort of clientele, but if you are looking for white people on a pleasure bender through the Banana Pancake Trails of Asia, this is the place you need in George Town. In recent years, George Town has seen a boom of “hidden bars” with quirky settings and stranger entrances. Think a fridge, a golden toilet that opens onto a Melbourne-styled graffiti-strewn back alley, or a Bruce Lee painting and a Wing Chun Dummy. There are a lot, and we discussed some in our guide to the 31 best places to visit in Penang at Night. If you are a backpacker interested in clubbing the night out in George Town, there are a bunch of clubs lined along Beach Street. Typically, the entry fee is around RM50 and sometimes this includes a drink, and there’s a popular Ladies’ Night on Wednesdays when girls enter and drink free of charge. Be careful ladies because this can become a problem if you get too drunk and locals will inevitably try to pick you up. The most happening club at the moment seems to be Ozoo. 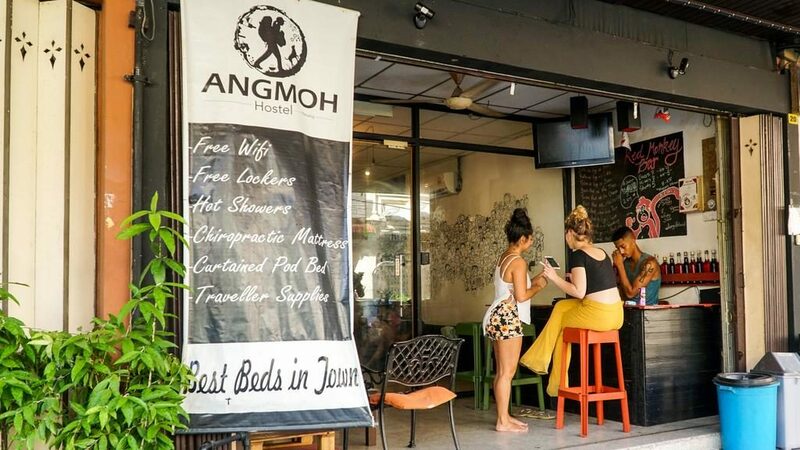 This is one among the best alternative markets in Penang and could be a perfect spot for Penang backpackers to go to on Sundays. 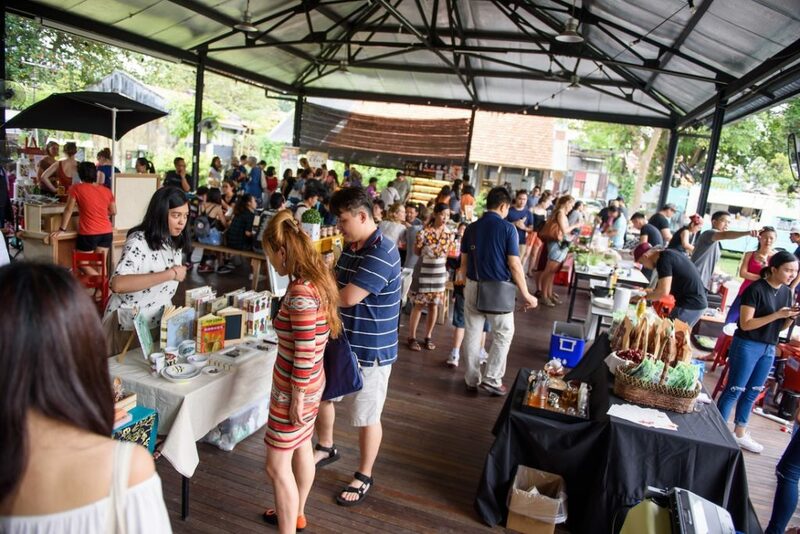 The open garden at Hin Bus Depot is the unbeatable location of a vibrant alternative market where backpackers may find interesting souvenirs, original artworks, meet local artists and independent thinkers, and also observe (or join) a session of acrobatic yoga (starting from 3 pm). The place also has several cafes and eateries, and although not the cheapest, could be a perfect place for a Sunday lunch. 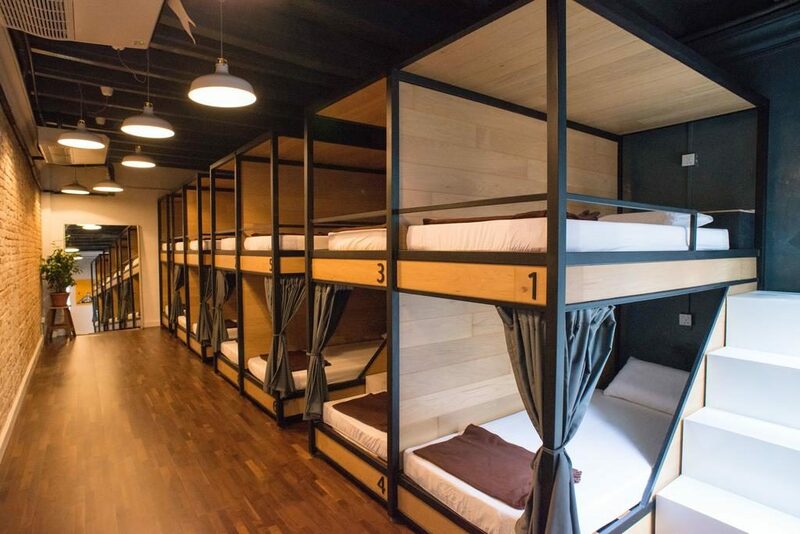 Most guesthouses and hostel offer this service, but you’ll end up paying more. 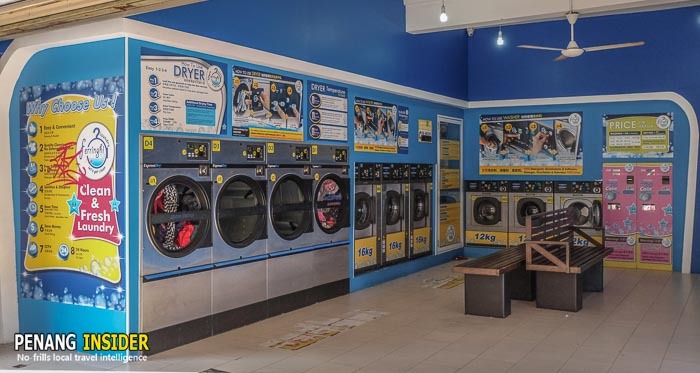 The best place to go is the coin-operated laundromat on Muntri Street, called Ferringhi Laundry. You can use machines to wash loads up to 12kg for RM6.50/7.50 (cold/hot water wash), or up to 16kg for RM8.50/9.50 (cold/hot water wash). Driers can stock up to 15kgs and cost RM5 per every 25 minutes drying cycle. There is a lot of food along Chulia Street, especially Chinese and Western, and it’s very easy to walk to nearby Little India for a fix of curries and rotis. Being filled with foreigners, Penang backpacker ghetto Chulia Street has a series of interesting Western and international food options. Holy Guacamole has Tex-Mex food and Margaritas, serving nachos, burritos, and all the range. Halab is more of a mid-range restaurant, but if you want some Syrian-Middle Eastern food for a change, it’s a very good choice. The section of Chulia Street between the junction with Love Lane and Lorong Sek Chuan packs a vibrant night street food market. Considered the vicinity of backpacker central, it’s surprising to see how much good food one can still find here. Be prepared for a local, authentic and not-so-clean experience: you’ll eat sitting at a roadside plastic table, with vehicles passing by, and you’ll see the hawker sellers wash bowls, chopsticks, and cutlery in plastic bins filled with water by the roadside. Is it safe to eat here? Of course yes: and if you don’t try any of the delicious Penang Food (see 26 best Penang dishes to start with) you’ll miss out on the experience. “Mamak” means “Indian Muslim” and often doubles for restaurants serving Indian and Malay food, without alcoholic beverages. There are plenty of these places along Chulia Street, and they often appeal to backpackers because they are cheap, and yet tasty. Kapitan is famous for tandoori chicken, so much so as Kassim Mustafa Nasi Dalcha. Both restaurants also serve classic Malay Indian staples such as mee goreng, fried rice, and the quintessential nasi kandar (white rice upon which a customer adds different choices of curries. You pay by the amount/quantity). Every serious backpacker wants to hit the beach, correct? 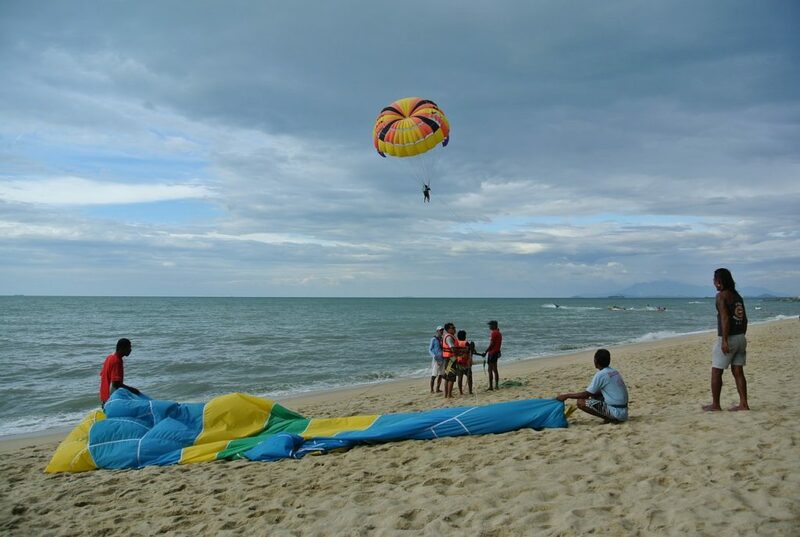 Well, Penang is definitely not so famous for its beaches, but if you are a backpacker with a desire to tuck toes in the sand, there are still some decent options available. This is Penang’s most touristy and developed area, whose beaches have been mostly enclosed by the many 5 star resorts present here. Regardless, beaches here are quite OK for a stroll, less so for swimming. Moonlight Bay is recommended, for it has a very good sunset view and a little bar on the beach that’s perfect for sundowners. The southeastern part of the island is the most natural and unspoiled, and so are its beaches, if you have the time/desire to explore. The best beach on this part of the island is perched at the extreme southeast and it’s called Pantai Pasir Panjang. It sits next to an army camp and is an arch of powdery golden sand fringed by a backdrop of tropical trees. Technically swimming is forbidden here — there’s a deep slope and most often the water has jellyfish. Be careful. 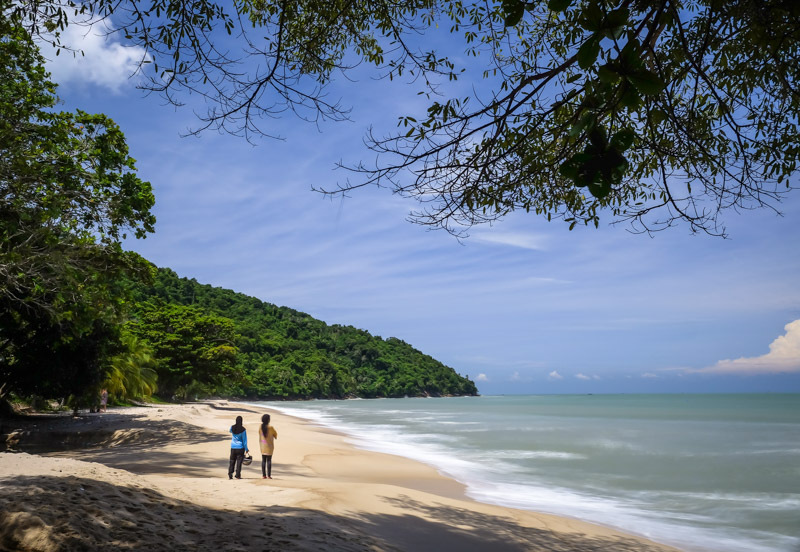 The national park, Malaysia’s smallest, has hiking trails and two different beaches: popular Monkey Beach, on the northeastern end of the island, and Pantai Keracut, or Turtle Beach, which is down on the eastern side of the coast. People will tell you that the trail to Monkey Beach is closed, but it’s not. You can hike without any problem and reach the beach in about an hour, provided you can cope with the not so stellar conditions of the trail. The beach itself has developed somewhat into a tourist beach, but it’s still a decent spot to visit. Pantai Keracut is better, wider and at the end of a better hike that crosses the National Park. On arrival, you’ll see the Meromictic Lake, where salt and freshwater coexists and never mix, which is one of two existing in the world. There is also a campsite here (remember, you need to hire a guide at headquarters if you want to stay overnight) and a small turtle conservation center where it’s possible to see baby turtles.